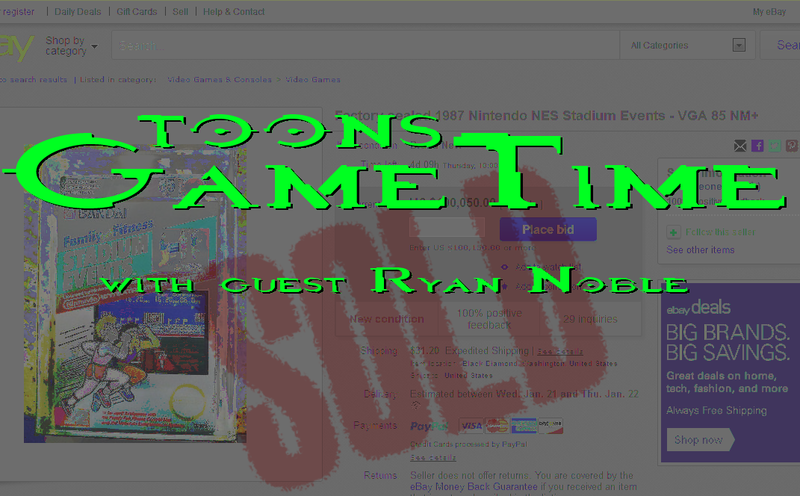 This week on Toons Game Time, Brian will welcome fellow Canadian (if Brian were Canadian) Ryan Noble from Construx Nunchux, Pens Initiative and A Very Barrie Colts Blog as they discuss the upcoming year in video games and some of the top news items form the video game industry. Already on tap for this week's show, what is considered to be the rarest of all released Nintendo Entertainment System cartidges in existence is being sold at auction and it can be yours! That is if you have a cool $100,000 just lying around. Head to eBay and bid on your still-sealed copy of Family Fun Fitness Stadium Games today. So long as you don't plan on actually playing it. After all, the one for sale accounts for exactly half of the copies still out there in it's original, unopened condition. Plus, the TGT Question of the Week is still open: What game are you most looking forward to this calendar year? Is it The Order 1886? The Witcher III? Bloodborne? Zelda? The complete-as-of-right-now list of games coming in 2015 can be found right here, so weigh in below with yours by Tuesday morning. Brian and Ryan will also tackle the question of whether or not Nintendo's sneaky streak of hit games can save the Wii U.